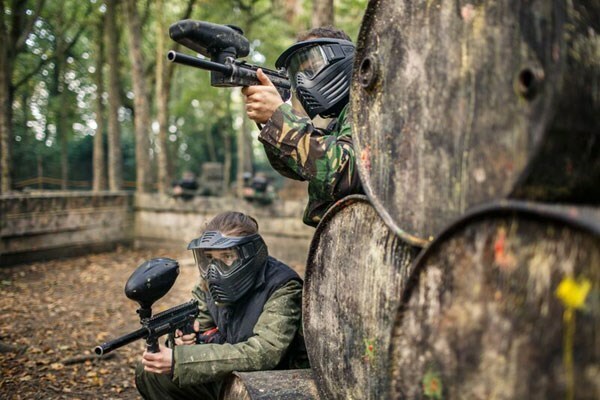 Located in over 40 acres of dense woodland, the paintballing Sidcup site is situated just off the A20 near Bromley. It has 5 game zones awaiting some trigger pumping action. Will you become Sidcup’s ultimate paintballing hero. Are you the birthday boy or girl, the bride or groom to be, the boss who would like the team to bond.Why not choose the ultimate adrenaline action packed day out at paintball Sidcup, Sidcup's premier paintballing site. Paintballing Sidcup - Enter the woodland warzone of the deserted village, tactics and bravery will be required to rid the town of the enemy. Who is hiding around the corner, ready to splatter you with paintballs? Can you liberate the enemy flag and gain the advantage of reaching the massive steel drums that are excellent for providing cover against the heavy hostile fire? Will your enemy reach them first. The Sidcup Paintballing venue has 7 different game zones offering a wide range of different games. It has quite simply one of the best fields in the South of England, incorporating a village, land rover trenches and bunkers, as well as a bazooka, line rocket and a massive explosion. Enter the woodland warzone of the deserted village, tactics and bravery will be required to rid the town of the enemy. Who is hiding around the corner, ready to splatter you with paintballs. Can you liberate the enemy flag and gain the advantage of reaching the massive steel drums that are excellent for providing cover against the heavy hostile fire.Will your enemy reach them first. It is in all honesty breathtaking and leaves you with the wow factor, guaranteeing you wanting more. Paintball in a village environment adds endless twists and turns that do not occur in normal wood’s play. Paintball in Sidcup offers a great village field in which to test all of your team’s tactics to the max. Each team starts either side of the village so that the main fire fight will ensue in the centre of town! The hut’s offer some great hiding spots for the players that want to snipe out the enemy with paintball. But also some great cover for the Rambo’s that want to kick doors down and clear buildings. Be careful of the blind corner’s you never know where the other paintball team maybe hiding! The clue is in the title of how this paintball game will unfold. This is the smallest game zone at the Sidcup venue that also makes it one of the most enjoyable paintball fields at. The teams start off within eyesight of each other so there’s no fear of a lurking enemy, but it works both ways- you know where they are and they know where your hiding. There is a lot of cover on this field, which encourages fast aggressive paintball. The best form of defence is offence and this field guarantees some close quarter paintballing action. A far more open field with two bases, two bases and one objective, “liberate” the enemy flag! Armed only with you paintball markers your team must push through to the enemy base camp grab their flag and return it to your own base. The middle of the field is dominated by oil drums that offer great protection from the onslaught. The two teams are sure to meet in the centre but make sure you remember the objective when the paintballs fly. Another great field at Sidcup. Bedlam Paintball Sidcup. The best paintballing deals in Sidcup. Go Bedlam Paintballing Sidcup is a pay as you go package to play paintball in Sidcup. The package includes entrance fees, game fees, paintball insurance, paintball marker gun, paintball hopper and propellant for the whole day.